Babies don't only see in black and white. Here's the colours they can see! Babies don’t only see in black and white. Here’s the colours they can see! Did you know that it’s a myth that babies see only in black and white? Researchers tell us there is much more to the story than that. So what colours can a baby see? Let’s talk a little bit about junior vision, before we delve deeper into the baby-colour-zone. When infants first enter the world, their vision is pretty limited – operating at around 5% of our own adult view. They can discern faces only at close range (around 30cm or less) and are unable to perceive depth, as yet. This all changes pretty quickly though. By the time a baby reaches the 6-month-milestone, they are seeing most of what we see. Vision has pretty much caught up with the grown-ups and it’s near impossible to slide anything past their eagle eyes. Anna Franklin, head of the Baby Lab at the University of Sussex, is investigating how colour is perceived by babies in those early, pre-eagle eye days. “It is a myth that babies see in black and white,” Anna explained, telling The Guardian studies have confirmed newborns can see large, intense patches of red on a grey background too. So why can’t babies see all the other colours from their very first days? Well, the colours we see are courtesy of cells in our eyes’ retinas called cones. Signals from these cones process colour, and cute little babies are born with under-developed cones and still-developing brains. Basically, they have some catching up to do- and as we said, this happens pretty swiftly. “By two months, babies can tell red and green colours apart; a few weeks later, they can also tell apart blues and yellows,” The Guardian reports. Anna’s team are testing infants in their BabyLab, popping monitors on them, showing them colourful dots and measuring how they respond. They’ve discovered small babies are able to see stronger, saturated colours – but not more muted tones. “If you show [a baby] some kind of washed-out green they won’t be able to see it, even if they can see a really intense green,” Anna explained. She’s aiming to prove that we’re hard-wired from birth to process colour – that it’s not just something we learn via culture and language. Speaking to the BBC, Anna said that babies seem to share a universal dislike of the colour brown, but have unique preferences when it comes to “favourite” colours. The jury is still out on why babies prefer one colour over another, though. She’s going to find out more. In this quest to discover how babies process and recognise colour, the BabyLab tested 170 babies. They found that the colour range they recognised and responded to was much broader than is commonly perceived. 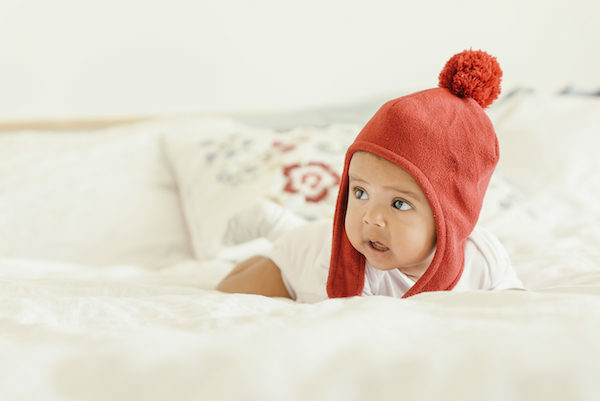 “The upshot is babies have got five colour categories, we think: red, green, blue, purple and yellowish-brown,” BabyLab’s Alice Skelton, a PhD student, says. The team say other colours, like pink and yellow, seem to emerge later as language develops. There’s still much work to be done on how babies really see the world, colour-wise, but it’s exciting to note that it’s not as monochrome as first thought. Colours of the world, light up your life, babies!